It’s typically used in two ways: 1. to store data and provide a clear separation between the data and presentation layer of the page and 2. to store data when some type of user activity occurs. 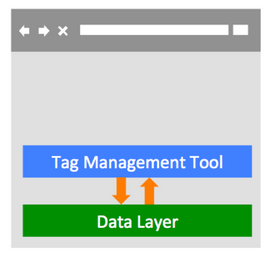 The information in the data layer can then be consumed by different web technologies, like analytics tools or marketing tools, through a tag management platform. Through the W3C community group we’re supporting the effort to standardize the format and syntax of the data layer. This will make it a lot easier for businesses to add data to HTML and access it with different tools. An industry-wide standard will create a common way that websites and tag management tools can interact – thus making it easier on site owners. How and Where Is the Title Tag Displayed? While your page title is essentially hidden in your code, there are four places it is visible. Each of these places have varying degrees of impact on your potential audience. When a search is performed, in most cases, Google and other search engines pull the page title to display as the clickable link. This is what most people see, scan and read as they are deciding which site to visit after a search. More and more, web users have multiple browser tabs open at one time. It may be three or four, or even dozens at a time. Your well-written title tag will help them find your information more quickly as they seek to navigate back to the open page. Keep in mind that usually only 1-4 words of the title will display in the tab, giving you viewable ranges from 25-50% of the whole title. This might alter the way you structure your title, placing the most important information first. When pushing content out onto social media channels, the title of your page is usually the title of the link that gets pushed out. If your title is too long or has additional words that are unnecessary (such as company name), this could lead to socialization of a not-so-compelling or interesting title. Since clicks are an important part of socialization, your title should be optimized for that, too. A title tag serves three main purposes of SEO, usability and socialization. They influence rankings, persuade people to click and increase visibility. As I mentioned before, if I could only make one change to a site for search engine ranking purposes, it would be the title tag. Adding or moving keywords in a title tag can mean the difference between a page not ranked and page ranked on the first page in the search results. Depending on your competition, it can literally have that much power. 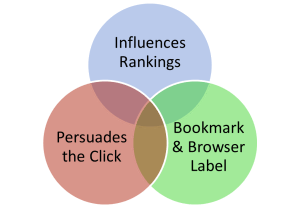 Since the title tag is (usually) displayed in the search results or on social sites, it is the often the very first point of influence in bringing someone to your site. If your title tag isn’t compelling, then all your top rankings and social shares ultimately won’t amount to a whole lot as potential visitors bypass it for other more compelling content. When looking for social engagement, the more compelling your title, the greater likelihood that it will be passed and re-passed and re-passed by the masses. Boring titles that get skimmed over don’t engage audiences. Exciting titles do. The higher your engagement, the better visibility your title tag earns you. Crafting a quality title tag isn’t always as easy as it seems. Every display platform has differing limitations and serves a different purpose. Obviously, good writing is essential to being effective. Poorly crafted and structured words are skimmed over at best, and portray a level of incompetence at worst. Using good writing practices will ensure you craft a title tag that is worthy of the attention you want. There is no doubt that choosing the right colors for a design is a very important step of the creative process. We need to think about the message and the style we want to communicate, besides also thinking about the best combination to please our viewers eyes and to deliver a nice result. Today we gathered some good examples of color use in web design. From subtle colorful details to colorful background images or bold colorful type, there are different styles here to show you how to add color to your next project. La nube y el departamento de TI. Una de las grandes promesas que hacen los proveedores de nubes es que la adopción del cloud computing reduce en gran medida los costes de TI de cualquier empresa. Una parte crucial de esta promesa, que se puede encontrar en la mayoría de las calculadoras de costos de la “nube” disponibles en Internet, es la reducción en los costos de mano de obra. Conceptos científicos para pensar mejor (3). Continuando con nuestra particularserie de errores cognitivos y precauciones para pensar mejor,dejo hoy tres ejemplos que nos van aproximando a los que serán los finales, cada vez más vinculados a la experiencia de uso de Internet, la sociedad red y la sociabilidad aumentada. Las etapas vitales de los eternos adolescentes. Nos damos cuenta que llega la primera adolescencia cuando percibimos expectantes los primeros cambios hormonales; en cambio cuando llega la segunda nos asaltan de sopetón y en múltiples ocasiones no se viven de buen grado, ya que no asumimos que el tiempo se nos haya pasado volando.